Are you tired of your own snoring and of your bed mate’s constant complaining about it? Are you ready to finally experience some peace and quiet during the night and to wake up in the morning finally feeling rested and refreshed? If so, then you should definitely check out our SnoreCare review. You’ll learn all there is about these premium nose vents that are proven to be effective against snoring and are not invasive and uncomfortable like so many other snoring aids. This product is ranked #1 on our Best Anti-Snoring Nasal Cones list. SnoreCare are nasal vents, consisting of two tiny tubes linked together, which go in your nostrils. They are made of medical grade silicone and they are very comfortable and easy to use. These nasal vents work by gently opening up your nasal airways, allowing for normal, natural airflow during sleep. For many people, snoring is directly associated with restricted airflow in the nasal airways during sleep. Nasal passages sometimes tend to slightly collapse and when this happens, you simply cannot breathe right. Snoring vents or nasal vents like SnoreCare open up your nasal passages and thus help you achieve a restful, quiet sleep. Everyone’s nose is different so it can sometimes be hard to pick the snoring aid that fits you best. 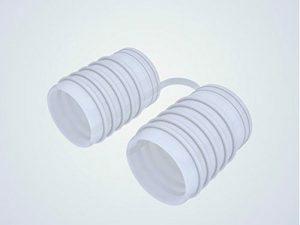 Fortunately, SnoreCare comes in a set that consists of one pair of large and one pair of small nasal vents with rings for extra comfort, as well as one pair of large and one pair of small plain vents without rings. You also get a convenient travel case for maximum convenience and hygiene. The vents are, of course, reusable and easy to maintain by washing them every morning with warm water and maybe some mild soap and leaving them to air dry. Our SnoreCare review and practical usage reveal a different and better tool than most snoring aids for several reasons. Firstly, there are no side effects commonly associated with mouthpieces like MADs and TSDs, which may leave you with a sore jaw and teeth, dry mouth, and general discomfort. Second, they might even be better than plain nasal strips since they go directly into your nose and regulate airflow from there. This product is made from high-quality materials and the new and improved version is even more comfortable and easy to use. Being transparent, these vents are almost invisible from the outside, so you don’t have to worry about embarrassing yourself with bulky or unsightly devices during travel or vacation. Another thing you don’t have to worry about is safety. Some people fear one of the vents will go way up their nose as they sleep. However, these vents are connected to each other by a tiny, discreet external link and there is no way they can get lost in your nose. Finally, they come with a money back guarantee and a 1-year replacement warranty, which is not something many other manufacturers offer. SnoreCare vents are surprisingly comfortable, thanks to their unique anatomically-friendly design and very soft materials. As we already said in this SnoreCare review, they are made of medical-grade silicone, so you know they feel nice and cozy in your nose. These nasal vents are very easy to use. There is no fitting or molding required, you simply pick the size that fits you best and decide whether you want to go for the vents with rings or the plain ones (you will get both types in your package). It is recommended to try out both of them to see which ones feel more comfortable and work better. The only reported problem regarding this snoring aid is the fact it tends to fall out during night. Since these nasal vents don’t exactly stick to anything, people who shift a lot in their sleep may wake up in the morning without them. One SnoreCare set, which includes a pair of large nasal vents with rings for better comfort, a pair of small nasal vets with rings, one pair of large and one pair of small plain vents (without rings), as well as a travel case, is currently offered at $16.95 (the original price was $34.95). If you are still unsure if SnoreCare is right for you, check out the key advantages and flaws of this snoring aid. 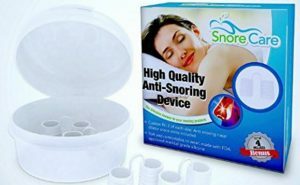 SnoreCare nasal vents are ideal for those who do not feel like using mouthpieces but are still desperate to solve their snoring issues. These snoring vents are soft, comfortable, reliable, and safe. However, don’t be surprised if they fall out in your sleep, which is pretty much their only downside. We hope our SnoreCare review made a difference and potentially guided you toward a solution for your problem. Our ratings are the result of an objective and independent evaluation of SnoreCare, generating the final rating that reflects the overall quality of the company. Ratings may change as the product introduces changes. SnoreCare user rating based on 8 user reviews. Even when I don’t snore, I still can’t breathe normally at night. I dunno why, my nose simply gets stuffy and I have to breathe through my mouth, which I hate. Snorecare takes care of that. I breathe through my nose with no problem at all, but I wish these cones were just a tad softer. This is a product that really works. The cones stay put all night, unlike some strips that fall off the moment I start shifting. I can recommend this product to everyone who wants to at least start snoring less. I mean, it really opens up your nose. I feel so much better when I’m using snorecare cones. I guess because I sleep better and sounder. These are some relatively cheap nasal cones, especially considering that they promise to last a lifetime, I mean you don’t have to buy fresh ones. They reduced my snoring by some 40% maybe. We found 0 verified SnoreCare discounts for April, 2019. In order to be sure that SnoreCare truly is the best solution for your snoring troubles, you need to know what makes it superior or inferior to its alternatives. Discover how SnoreCare compares to other popular snoring aids of its kind with our detailed feature and price comparisons and easily determine whether you are making the right choice.